Plans for A Walk for Water in the Washington, D.C. area, are developing smoothly. With the cooperation of Rock Creek Regional Park, sponsorship from local businesses, and the volunteer efforts of teachers and students from local schools, the event will take place on May 12, 2007. Students from the Oneness-Family School, the Barrie School, the Evergreen School, the Love of Learning Montessori School and the Monocacy Valley Public Charter Montessori School, together with their friends and families, will walk 3.25 miles on the paved and wooded paths surrounding Lake Frank in Derwood, Maryland. Students are encouraged to seek sponsorships for each mile they walk from friends, family members and neighbors as a way to raise money and inform the community about the plight of the children in this region who, daily, have to walk up to 30 miles a day in search of water for their families. Registration forms are starting to come in; we are hoping that around 100 students, plus their families, will walk together. 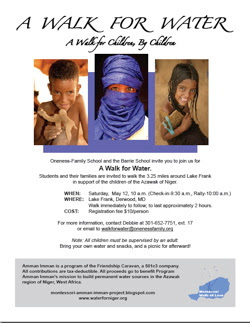 If you have friends in the D.C. area, please tell them about A Walk For Water. Everyone is welcome to join us! You can download a flyer, registration form and sponsorship sheets by following the instructions in this link: Instructions for Downloading. Through Amman Imman, students are well-informed about the conditions in the Azawak, and what people go through on a daily basis, whether during the dry or rainy season, to have water. 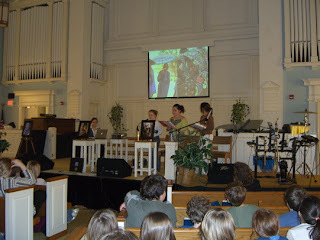 Students at Oneness-Family School first heard about the Azawak, when Ariane Kirtley came to the school in October, 2006, and spoke to teachers and students about Amman Imman’s mission there. Her stories, illustrating the extremes of poverty and generosity, lack of water and abundance of spirit in the people of the region moved the community deeply. Since that time, Oneness-Family School students have taken the message outward, first with Ariane at a Montessori conference in Florida, and then to students in other schools. Using a slide show of Ariane’s pictures, the Oneness students presented the Amman Imman project to students at the Barrie School and the Monocacy Valley School. Subsequently, students from the Barrie School presented Amman Imman to students at the Evergreen School. Oneness-Family School students are again scheduled to present the project at the Love of Learning Montessori School on Friday, May 4. A Walk for Water provides an opportunity for students in America to walk in friendship and solidarity for these children, making a statement that says: we are going to do something to help; we are changing the balance of things; we are here for you, our brothers and sisters. It is a powerful message from children in a land of abundance of resources for children in a land of scarcity of resources. Yet it makes sense: both children share the most important thing in common: plenty of heart to give and live. 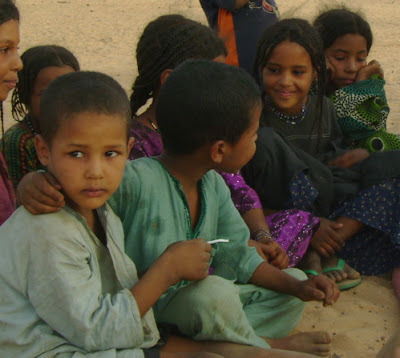 When you see Ariane's pictures of the beautiful children in the Azawak, you see their spirit, you see what helps them thrive despite abominable conditions where their lives are in danger - not from violence or threat of crime, but simply because they do not have any water to drink. This is a crime above all other crimes because it can be prevented...and it is a basic human right. There is enough on this planet for all to thrive, and if our children can set the example of helping the children in the Azawak thrive by simply providing them water, then they are setting an example for the world to follow, to come together and find solutions to provide the simple necessities of life to all the children in the world so that they can grow up. These wells may be expensive to build because the water table is very deep, but they are not expensive in the scheme of things, in the value of life on earth. There is a quota that is unreachable in terms of the value of life, and that is the message we want to send, not only to our children, but also to the children in the Azawak. Both deserve to know that life provides enough.